Apple released new AirPods 2 earbuds this week, complete with wireless charging case. It also has a wirelessly-charging iPhone range, and a wireless charging Apple Watch line. What it doesn't have, frustratingly, is a wireless charging power mat that can serve them all. 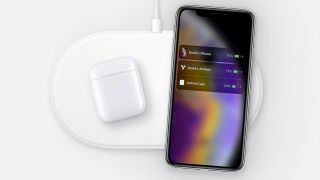 Having announced it itself during a September 2017 media event, we've known for ages that Apple is working on its AirPower wireless charging mat. But rumors have pointed towards it being a troubled products, with Apple's engineers unable to get it to work in the way they had intended, with the device charging three devices at once. However, with the launch of the AirPods 2, it may now be closer to release than it has seemed to be for quite some time. 9to5Mac was tipped off of new AirPower imagery on the Australian Apple website, showing the device alongside the newly-announced earbuds. Digging deep into the photo, the industrial design of the AirPower accessory doesn't seem to have changed, but the way it interacts with a connected iPhone potentially has. The iPhone is still used to display the charging status of all items placed on the mat, but it looks as if it no longer also shows the time when doing so. Though the image was hastily pulled, traces of it remain in the page's source code, pointing to the fact fresh photography of the device is being created at Apple. There's still no official release date for the AirPower charging mat yet, but this is a snippet of evidence suggesting that we may, finally, be edging closer.